Mumbai: Blame it on the moon. Retailers and companies looking forward to a lucrative festival season are beginning to realize that their expectations may not be met. That’s because of an almost two-month long break in the season, courtesy the lunar calendar that is followed in most parts of India and which decides when a festival is to be celebrated. India’s festival season typically starts in September with Ganesh Chaturthi. The following months are replete with festivals: Dussehra, Ramzan and Diwali, which usually falls in November. December brings with it Christmas and the New Year. And January sees most parts of south India celebrating the harvest festival, Pongal or Sankranti. This year Diwali falls in the middle of October. That means a break in the festival season till Christmas. And it means a gap of just around three weeks between Dussehra and Diwali. “The sales generated during Diwali will not be the same as in previous years as the number of days between Ganesh Chaturthi and Diwali this year is less by at least 20 days. As such we expect our sales to reflect a volume drop of close to 5%," says Mehul Choksi, chairman and managing director, Gitanjali Group, a jewellery firm. Still, Choksi expects sales on days considered to be auspicious for buying gold and jewellery to be as good as they were last year. Other firms face a different problem: customers who have finished making their festival purchases. Worse still, the early start to the festival season meant some customers finished their shopping in July and August when most brands were on sale. Tarun Vohra, a mid-level manager with an information technology firm says he’s both brand and value-conscious. “I like to wear brands but don’t like to pay an astronomical price for them and hence have completed my shopping during the end of season sales and now will not shop for Diwali," said Vohra. That hurts most firms because a significant portion of their annual sales comes during Diwali. For makers of consumer products such as television sets and washing machines, this proportion is 30-35%. It is a third for apparel makers and a fourth for firms in the jewellery business. To address this, retailers and manufacturers are resorting to discounts and promotional offers—much like they have done for the past year. “Today, a consumer is looking for a great product, quality and value. If a consumer does not see an offer with a brand he may pass it for another," says Mohan Murjani, chairman, Murjani Group Pvt. Ltd, which is behind Tommy Hilfiger, Calvin Klein and FCUK brands in India. “It has become a promotional environment, making it a level playing field for brands as everyone is offering something." Tommy Hilfiger gives buyers a free wallet on purchases worth ₹ ,000 and a bag worth ₹ ,000 on purchases worth ₹ 8,000. Such offers make more sense during Diwali. 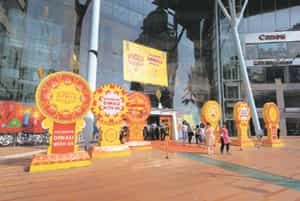 “The Diwali month can make or break a brand or retailer," says Nilesh Gupta, managing partner, Vijay Sales, which runs a chain of outlets selling products such as television sets and washing machines in western India. Sales of products such as television sets and washing machines typically peak during Diwali and then taper off till early next year when they peak again for a very short period in January, according to Gupta. That could explain the rush of promotional offers from companies in the business. And, in turn, that translates into good news for customers provided they get their timing right. Mumbai’s Jyoti Goyal didn’t. She bought a 42-inch TV for Rs67,000 only to see the price fall by another 10% a fortnight later. For other firms, this Diwali presents an opportunity to try and sell reasonably priced products. Lifestyle International Pvt. Ltd, that runs a chain of department stores across India has launched apparel priced at Rs99, Rs199 and Rs299, a drop of around Rs100 in each case from last year’s prices. “A drop of Rs100 is very high on these numbers. We felt we should become more relevant and make the customer feel that we will offer them more value," says Kabir Lumba, executive director, Lifestyle International. For others, Diwali offers an opportunity to get rid of inventory. “I will be giving discounts on categories wherever my products are stuck. You can say that this is something more than what we normally do," says Ambeek Khemka, group president, Vishal Retail Ltd. Vishal has around Rs630 crore worth of inventory on its books and Khemka hopes to reduce that number by at least Rs200 crore by March. Delhi, which typically sees traffic jams on its streets in the run-up to Diwali, continues to experience them this year as well as last-minute shoppers scramble to buy gifts, but retailers in the city and in other parts of the country remain cautious. “The consumer is still cautious. He is spending, but not splurging," says Govind Shrikhande, managing director, Shoppers Stop Ltd. The chain has seen 17% less shoppers this festive season compared with last year. Still, Shrikhande says there are signs of things returning to normal by December. But discounts are likely to continue, says a consultant. “Promotions that have been happening through the year will continue with the focus being on loyalty programme, cross promotions and gifting as there is so much discounting that happened last year that consumers are now used to it," says Anand Raghuraman, partner and managing director at Boston Consulting Group.